Customer Testimonials - CPT Autopilot Inc.
We decided to bring back the CPT because of its reliability, not only from personal experience, but from the abundance of testimonials. These are excerpts from some of the letters than have been sent to CPT over the years. We have now installed the autopilot provisionally and used it for a week in different conditions. Installation was very straightforward, took less than one hour. We are still looking for a permanent place for the control box, though. 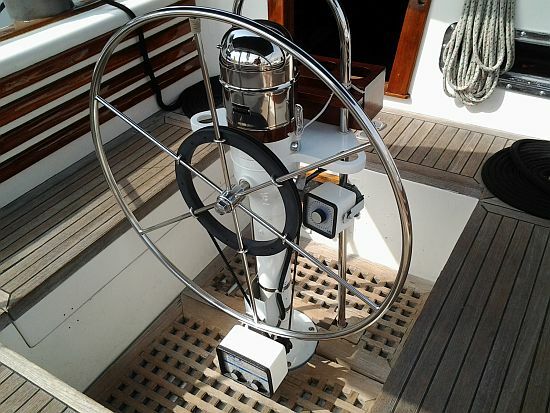 The pilot works very well, has no problem steering our 78´ketch, is very quiet and uses very little power. It adopts without problems to sail changes, changes in balance. Although, this is a well-balanced boat in itself. In flattish water, low rudder settings (1-2) work well. At low speeds, like when heading into the wind to set sails, the rudder setting goes up to 5. Making larger turns by autopilot leads to overshooting, but the boat finds its course within a few oscillations. Here a counter rudder adjustment, like in the old commercial autopilots, would be useful, but would make the unit more complicated. Attached are links to two clips. One beam reaching in light conditions, and the other on a broad reach at 10-11 knots boat speed in about a 15 knots breeze. S/Y Spirit of Ziana, 78´LOA 73´LOD ULDB cruising ketch. Will shared a video of his recent CPT Autopilot installation. Thanks for the help and advice on purchasing the CPT. Install was easy, and we just used it on a crossing from Florida to the Bahamas. I did a video review here. I am sending you this note to commend you for your excellent service. We received the CPT autopilot in record time and were able to make our voyage to the Bahamas on schedule. I was very impressed on how well the CPT autopilot worked. We are using a Garmin 741xs as our primary chartplotter. We use the compass function on the Garmin as it shows how far we are off course and what degree the course adjustment should be. We adjust the CPT using the (+)(-) buttons and watch ourselves come back on course. It couldn’t be easier. February 2017, Passport 40 S/Y "Malaya"
… I am impressed with the simplicity of CPT Autopilot both in installation and use. I also find they are pretty easy on the ships batteries. I have also been very happy with the customer service I have received when it has been necessary to call. It is refreshing to actually call a business and speak with a human, not have to leave a message for a later call back or be told to contact them online. I realize in this day and age that this business practice may be somewhat out of date but it is in my opinion the best way to maintain customer satisfaction especially if the call is for a problem. I am hoping before long to start writing articles and producing videos of sailing and cruising skills. These videos and articles will be based on my 40 years and over 100,000 miles of experience sailing literally dozens of different boats as well as my years in the marine trades in a variety of skills. Hopefully I can in the process spread the word about CPT autopilots. November 2016, Catalina 36 "Tipping Point"
I have been meaning to give you feedback on this autopilot, now that it is at the end of our season I can tell you how your technology worked for us on the Tipping Point, our 36’ Catalina. The biggest risk of having this autopilot is to remember that you have to stay alert and keep your eyes open ALL the time because this system is so good it can give you a false sense of security. I wish I can give you negative feedback about its operations so you can improve upon it but I have none! This is a letter to thank you for the extraordinary customer service. This was first realized to me when I was installing the unit. You took all the time that was necessary and walked me through the process. Then our CPT performed flawlessly for a long time. It was after about ten thousand miles in offshore conditions and regular use that our CPT needed some attention. We were half way between Hawaii and Vancouver Island. I sent you an email over the Ham radio and you responded immediately. You identified the problem and instructed me on how to deal with it. We were no longer in hand steering and this felt amazing because we were motoring across the Pacific High. The high had just shifted and was stretched out in front of us. Yeah CPT! Anyway you outdid yourself when you insisted that we ship you the unit once we were no longer offshore. You tuned things up and you even replaced the motor that we had worn out through the grueling offshore sailing. You also shipped the unit back to us, and all us this without any charge. Basically what I am trying to say here is that you are greatly appreciated to us in this day and age. Your business style is much like your product itself, in that you provided the strait up goods. The CPT autopilot is simple and easy to use. There are no NMEA feeds or Bluetooth connections. Your autopilots are waterproof, powerful and very effective. I am a professional mariner on the West Coast of Canada and I know a good instrument when I use one. We had some difficulties with the delivery of Antalya, but not related with autopilot which behaved nicely. The boat was 2 years in a yard, and September is not the right time to bring the boat to the Azores. The delivery skipper had had return to Lisbon to correct some smaller problems with sails and the structure of boat. He had good reason! There are no yards between Lisbon and Azores!!!! But I was told your autopilot behaved bravely in every sailing condition. I was very happy to know that! Next year I’ ll gave you more news. Of course, more good news. February 2015, Peterson 46, "Tainui"
I had an opportunity to sea trial the CPT. In a word.....fabulous! We had 25 knot winds, and I was beating the whole way. Had full sail up (too much) and even over powered, the CPT held strong. Tacking was so much easier as a single hander. Just let the buttons go, and tack she went. I also was heaved to for lunch, and the CPT was great! My boat was a difficult installation because of how she is configured, but with help....it all worked out. Well, my autopilot finally arrived. The unit was so simple to install, from start to finish took an hour. It’s so easy, everything fitted perfectly and I am very impressed with the quality of the unit. I am a boatbuilder and have installed a lot of autopilots over the years and this is the best I have ever seen. In over 4000 nm of use (down the West coast from Washington to the tip of Baja, down the Pacific coast of Mexico and back into the Sea of Cortez) and through many sea conditions, the CPT has performed flawlessly. When we initially bought the CPT we thought we would only be using it for motoring since we had a Hydrovane for sailing. We found that even for sailing it performed beautifully when we used it, and drew very little power. Taking into account the simplicity and ease of installation, the price points and phenomenal customer service, the CPT is unbeatable. I purchased and installed your CPT autopilot in September of 2011 on my 1985 46' Venus Ketch and could not have been happier with the reliability, thus far, at which it operates. Over all, since I have installed the CPT autopilot–which, by the way was very straight forward and easy to install in less than two hours–has become an integral part of my cruising/sailing life. Last year I completed a singlehanded six month cruise from Redondo Beach, CA up the Oregon coast in the North Pacific and I couldn't imagine doing it without the CPT as my autopilot. Every time I activated the CPT, I found myself becoming more and more confident that it will function exactly as expected. Several times during my cruise, I found myself in weather and conditions that would test any crew’s abilities. However, with the CPT autopilot as part of my crew, I was able to confidently and safely cruise to the next port of call. Therefore, one of the best decisions for equipment that I have ever made was to purchase and install your CPT autopilot. You have my endorsement whenever anyone asks me my opinion about an autopilot. Without trying any other, I recommend the CPT for both ease of installation and reliability. We went out both days this weekend (it was gorgeous!) and we had a lot of fun with our new autopilot! I just wanted to let you know how pleased I am with how well the CPT Autopilot performed during our recent 300 mile passage in some of the roughest waters on the ICW. Our trip south from the Albemarle Sound to Oriental, North Carolina was relatively calm, with light winds blowing around 8 to 10 knots during our three-day trip to Oriental. The CPT kept us on course with ease and allowed for a very relaxing trip aboard our Compac 27 sloop. Unfortunately, hurricane Sandy skirted the North Carolina coast just prior to our return trip back to our home port in Columbia, North Carolina. We weathered Sandy aboard our boat while docked in Oriental. The effects of Sandy were still lingering as we headed back home. Winds were blowing in the mid 20s with gusts in the upper 30s as we navigated through the Neuse, Pamlico, Pungo, and Alligator Rivers, and finally the Albemarle Sound. Anyone who has traveled the ICW knows how rough these waters can be in a blow. Seas were very choppy and averaging from 4 to 6 feet as we motor-sailed back home. Again, the CPT handled the conditions extremely well and kept our small 30 footer on course. There was no belt slippage and it was obvious the CPT's strong motor was under no strain with the rudder control set at 3 and the deadband at 4. One one occasion, I had to leave the helm to untangle my headsail sheet during these conditions and I felt confident the CPT had the boat under control. 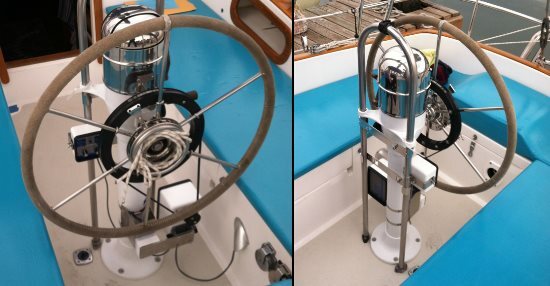 I would recommend this autopilot without hesitation to anyone interested in adding a rugged, dependable and easy to install wheel pilot to their sailboat. Thanks so much for your assistance in customizing the CPT for my Compac. I am pleased with my new CPT on my Alberg 37 Yawl. I've just arrived in Alameda, a three day trip from Garibaldi, OR, in mostly pea soup fog. Just wanted to let you know how well the CPT worked. We crossed the bar and turned it on, without any opportunity for sea trials, and it worked flawlessly in all conditions with our Cal 2-46. As it happened we were able to also get our large hydraulic autopilot working, and were able to compare the two. I couldn't help notice the very low power consumption of the CPT...at least a third of the other. Anyway just wanted to give you some follow up, and thank you especially for your personal attention throughout this process. Just wanted to thank you guys for the great service. All of the planning before installing sure made the installation go smoothly and quickly. The unit is working very effectively steering the boat. We're off the docks and cruising the greater pacific northwest. I've attached some photos of the installation. I used an Edson mount for the compass unit. I'm already using two of the Edson mounts, one for the radar and the other for the chart plotter. The installation looks very good and the compass unit is in a very "handy" location. Hi, I have installed the CPT and completed dock tested and sea trials. On my first sea trial there was no wind and it was flat calm the CPT gave a great performance. The second sea trial we had about 14 knot wind lite seas. I put the boat into the wind and set the CPT to hold course while I hoisted sails and the CPT held us in to the wind perfectly. When sailing the CPT did a great job holding course. This is the first time I've sailed with an auto pilot and I was very pleased with the freedom that the CPT afforded me. Thanks! The installation of the CPT Autopilot went well. My wheel wasnt exactly straight so I put a few shims between the adapter and wheel spokes that did the trick. I took the yacht out to day in good weather for a sea trial. I was very impressed with its ability to maintain a course. It is amazing how the CPT does the job so quietly. In a couple of months I will take Warlock on a coastal trip down to Jervis Bay. I will let you know how I go. Thanks for an excellent product and your excellent level of customer service. We have mentioned a few times along the way, how incredibly happy we are with the new CPT Autopilot that we installed before leaving Seattle. It has been simply awesome! The system is built very rugged, is simple to install, and operate. In this day and age where every one wants the autopilot to be connected to rest of the navigation system, we wanted a simple, strong, and for the most part fool proof system. That's what we got. And, other than the very worst of the weather we faced, it has handled everything we have thrown at it. Now I have no doubt that there are a lot of great autopilot systems out there, but what we feel truly makes this one exceptional, is the owner. From the day we met Jeff at the Seattle Boat Show, we were impressed with his dedication to service. When we ordered the autopilot, he went out of his way to make sure we got the exact parts that would be correct for our Freeport steering system. He communicated several times with us (in person) as we fit the system to the boat, and sea trialed it. If we had a question, he had an answer. If we called and missed him on the phone, he called back promptly, every time. Now that we are in Santa Cruz, very near Aptos, where Jeff lives, he came down to the boat, checked to make sure everything was all right, and even had a couple of suggestions for improving the way we installed it. These changes will make the day to day operation of the system much easier for us by relocating the controller. The next morning we had gone into town to correct a few shopping problems that we had from the day before, and got a call from Jeff. He was on the boat, had completely rebuilt the system to the new spec's we had discussed the night before. This guy is amazing!! If you are looking for a new system, give this guy a call!! As you can see above, even Lefty thinks Jeff is awesome! So, if you are reading this Jeff, Thank You so very much. This last weekend we were coming back to our local port, Knysna, from a regatta and ran into bad weather - 5m swells coming from a storm 100miles out in the Southern Ocean. My wife, the only crew member, got seasick and we had an 8hr trip. There was no wind so we had to use the engine. We used the CPT together with a handheld Garmin 76 and with only the odd slight adjustment CPT kept us to within a few feet of the course. When we got to the narrow entrance of the Knysna Lagoon the sea conditions were so bad we were unable to get through. This meant another 4 hrs to get shelter at the next bay. Without the CPT I am sure that we would have been truly exhausted with just 2 onboard hand helming for 12hrs. Thanks for the repairs that you did on my very old autopilot as after condemning it and almost saying its not worth repairing you have done a great job rebuilding it. We have refitted it to our Tanton 43 Amelia and it works like a dream in a good old English channel choppy sea in force 5 to 6 winds with quite large seas at times. The boat sailed great just on a Mizzen sail reefed down and at times we were doing 7 knots—not bad for one sail and a 13 ton yacht. You can now add Tanton 43 to your list of yachts helmed by your CPT autopilot. Hi, you sold me an autopilot this August as you may remember. I installed it while anchored off an island on the Maine coast. I just want to say how very pleased I am with (a) your service (b) your forethought and subsequent documentation and (c) your product. It truly lives up to its testimonials. In this day and age, it's refreshing to find this kind of quality and personal attention. First and Foremost I want to thank you for the recent repair of my standby CPT. I tried it and it works great! It is a pleasure to work with a company and people of your capacity. …If you folks ever need an east coast representative, I’ll be your best advocate, these units are the best product in existence. I'm in big seas....12-15 foot rollers on my port quarter with the odd series 20 foot and up. Hurtling down the faces reaching 17 knots today....3rd reef. CPT flawless. Its amazing this boat...did 21.8 knots down a wave today...and amazing the CPT took it in stride. So you see the sort of forces CPT is dealing with. So far I am pleased with Shearwater in those rather dangerous conditions...surfing...she has never seemed out of control...scary yes but always seems under control...nothing so far feeling like tripping over keels etc. Lets hope I’m right in my analysis so far. Am closing in on Marquesas...have less than 1000 miles to go. all the best and thanks again for staying with me. We must tell you that this unit works wonderfully for us! We used it on our recent trip from Florida to the Exumas. Even with strong following seas, it worked great. Better than having more crew! We named it Charlie P. (T for Tzareff), and he is now a most valued crew member. We're 40,000 lbs empty and were heavily provisioned for a month, so were much heavier than that at least on the way over. It performed exactly as expected and even surprised us at how well it handled the following seas, confused seas, and some pretty strong winds. Thanks for bringing it back! We love it! You sold me a CPT Autopilot last October for my Westsail 42 which was on a mooring in New York City. On November 1st I pushed off single handed for Bermuda and had the most hellacious voyage! I feel like I owe my life to the CPT Autopilot. The CPT steered flawlessly under power, under sail, while motor sailing, and even in very rough heavy weather conditions. The only break the CPT got when was I had to hove to in sustained 40 knot winds gusting to 56(!!!) for 2 days. After the storm I encountered a 52 foot, 40,000 lb sailboat in distress. S/V ‘Cha Cha’ had lost all steerage, engine, ability to raise any kind of sail, nav lights, bilge pumps, and had no way to generate electricity. She had been adrift for 2 days under bare poles. I (and the CPT) towed that boat 150 miles to Bermuda! The CPT Autopilot not only proved herself, but deserves a medal! Also, the drive belt tensioner worked fabulously. Well, it’s in and I love it. …Sea trials went great! The unit is extremely quiet, I like that. Going between Richardson Bay and SF in 26 knot wind it performed pretty darned well. We had the belt too loose so it skipped some gears in a heavy wind, tightened it later so that problem should be gone. But it did an exceptional job. Using the remote for steering under power was a dream, kinda like using a computer mouse. Overall, it was very easy to install, it works, very well, has low power consumption, and it's quiet. Two thumbs up! I was so happy to see the CPT back on the market. We bought ours in 1993 and installed it on our Tayana 37. I was concerned at first because anyone who has sailed the Tayana 37 knows how bad the weather helm is on these sea cows. But the CPT made us the envy of all the other Tayanas we encountered during our three year Americas tour. Those that had them, loved them. We sold the Tayana when we returned in 1998 and the one thing that really tickled the new owners, was the CPT. and it continues to work flawless for them. It seems that electronics on a boat need to be upgraded or repaired every couple of years. But the CPT is the best investment I ever made, just turn it on and let it do the work. We have purchased a 45 foot Europe sedan trawler, (another Tayana), and although the current course setter works most of the time, I found it inadequate in rough pacific NW storms, it just gives up!!! I read your info on the new systems and I think it will handle this boat with ease. Eron...Many thanks for the fine work that you or your guys did on my CPT. It is like working with a totally different animal. I used the pilot last weekend and was totally surprised with the precision and ease of finding a course and maintaining it. Thanks for the manual dodger which works excellently as a fine course tuner. We did take our windvane off Content as part of the refit for two reasons, one the vane clanked in a seaway and at anchor and since we sleep at that end of the boat, it always kept us awake. The BOOM was shocking, even when the vane was lashed down hard, or soft with bungee cord. But, the second reason was—we got the CPT and it steered us flawlessly, under sail and power, on the nose with the Baja bash north and downwind in 40kts. So we didn't need the vane. CPT crew: Nice work on such a killer product. We are just finishing a five night passage to El Salvador from Mex. We did the quick installation, dockside and sea trial, then left. We learned how to use the pilot easily and are very impressed. We did our trial run across the dreaded Tuhuantepec. I used the remote control to navigate up a canal following a bar pilot. We had about every condition variation on the trip. Thanks soooooooo much. It makes our other unit...seem like a toy. We are very happy with your autopilot. We use it all the time on our Morgan 50'… Last year in a gale enroute from Florida back to N.J., we were in very heavy weather for 28 hours and would have been exhausted hand-steering. The autopilot served us very well through it all. Kept us on course 100%! During our voyage from Long Beach to Seattle we encountered two blue-sky August gales with winds over 55 kts. The autopilot continued to steer even though the cockpit was almost constantly thigh high in saltwater. In fact, the pilot spends its entire life mounted on the steering pedestal in the wet Pacific Northwest, and has never failed us in over 13 years. While it doesn’t have a fancy shaped case and a digital display, it is simple, robust and reliable, a perfect match for…our heavy cruising sailboat. Charlie:…we also had a very modern and sophisticated autopilot…and as a back-up, picked up a CPT from a cruising friend. The modern pilot failed on us again, repair was going to be expensive and parts not easily accessible in the middle of the Pacific. The CPT ended up doing a lot of the work in all sorts of conditions. Our cockpit was flooded at one point, but when we next needed the CPT, it worked as if nothing had happened. Interestingly, the CPT was the quietest unit, even quieter than the windvane, that has a quiet kind of clang to it. At the moment we are refitting and preparing for a circumnavigation. The CPT is coming with us…Our unit, though old is extremely reliable, strong and very quiet. The unit, which we affectionately call Otto, has worked endless hours without complaint over uncounted miles. It was originally purchased in Oct. ‘88, 10 years of virtually trouble-free operation. Thanks for a great product. Mr. Pukit…I’ve been using my CPT Autopilot for over 8 years now and in the last four years alone I have put over 15,000 miles under my keel while charting the islands of the Bahamas and the Turks and Caicos. Of those miles…somewhere in the neighborhood of 80 to 90% were while under the control of the CPT Autopilot. From flat calms under motor to 40 kt winds and 15' seas, my CPT Autopilot has handled my 40' sloop, IV Play, safely and dependably. I really like the low noise of my CPT Autopilot. My other belt-driven autopilot, long ago regulated to a locker as a spare, would drive me crazy, buzzing and whining with each turn of the wheel. I originally purchased my unit because of your display at the Ft. Lauderdale Boat Show. Your display unit was mounted in an aquarium, underwater and running. Even with this I was skeptical that it would remain waterproof in the long run. I have to admit that through the years it has indeed proven waterproof. Rain, spray, even the occasional wave has failed to violate its waterproof integrity. All in all I wish most of the items that I have invested in for my vessel satisfied me to the extent that your product does. I am leaving…for the Turks & Caicos and my CPT Autopilot will definitely be doing most of the driving. Jim: We wanted to take this opportunity to tell you how wonderful we think your CPT autopilots are. We have now been cruising for about two years and the CPT has truly become a part of the crew! Several months ago, while at a marina in Ixtapa, Mexico, at least 4 boats were waiting for their autopilots to be repaired or had all gone to their back-up systems. None of them were CPT’s! The 3 boats at the dock that were all very happy with their autopilots ALL had CPT’s. We recently made a passage from Mexico to Costa Rica and encountered the Tehuanepec & Papagayo winds. Our CPT worked even in the 30+ knot winds. Thanks for making such a good product. CPT:…This unit has performed flawlessly and almost continually from Virgin Islands to Block Island, Rhode Island to Venezuela and back!!! It handles my 39,000lb CSY 44 in up to 50 knot winds! (for the past 2½ years). CPT: Gwen and I would like to give a big “atta boy” to our CPT Autopilot for the flawless and efficient way it handled our 35' Rasmus, Princess Del Mar on our recent three ocean voyages. We used the pilot 100% of the time in all conditions from the mid-Pacific to Florida, via the Indian Ocean & the Cape of Good Hope. Even though Princess was equipped with a good workable steering vane, we chose to use the Autopilot for its ease of operation, its far superior course holding and its amazing reliability and economy of power. While other cruisers complain that they cannot use their autopilot as much as they would like because of mechanical failure and/or high power consumption, we have found “The Autopilot” to be trouble-free and power efficient. Obviously we endorse your product very highly, and we now understand why it is called “The Autopilot”. Sirs:…The Autopilot I got is the old Orinda Control that you converted for me 3 years ago…13 years old, this month and 36,000 miles—not bad for the old girl! Sir: I just finshed a trip from the Bahamas to Europe and back to the Bahamas with it and I’m happy to report that on this first trip of any consequence that it really got used. It steered the whole way, over 8,000 miles, and didn’t have a problem until we were about 150 miles from our destination in the Bahamas. I simply removed it and installed the spare CPT which I had on board and within 15 minutes we were back in business. Charlie: The unit worked perfectly during the cruise in all of the usual and unusual conditions one encounters with the best of planning. This cruise provided a situation where the remote of the autopilot allowed us to continue for 6 hours in a fog so dense the visibility was reduced in some cases to less than 50'. To make matters worse, we were in the middle of the worst crab trap field I have ever seen in many years of cruising the Gulf of Mexico. By standing on the pulpit with the autopilot remote we were able to successfully steer through the maze without a single close call. I do not believe we would have had the same success using a lookout on the pulpit giving directions to the cockpit. I’m certain the required reaction time or misunderstood instructions would have wrapped a number of lines around the prop. We were about ready to drop the hook when we decided to try the remote unit as stated with excellent results. Our Irwin 37 deep draft sailboat which in honesty handles like a tank in smooth water under power. I can say the pilot performed beautifully under any and all conditions. We encountered a similar boat in Key West with a competitive unit, the motor of which burned out after 3 days. Jim: The unit has worked great until my new dog decided to chew (shred) the two wire bundles that come out of the bottom of the set. The unit is 4 years old and works fine. Also, I purchased a second unit for a German cruiser friend for his 36' sloop, and at last report he had gone several thousand miles and is delighted with the performance. Charlie: After the Trans-At, we decided to sail on to the Azores & Mallorca. Our [other brand] failed b/t Daytona & Bermuda. It’s the unit that was on the boat when we purchased it in 1990—3rd failure. We put CPT in service and all is well. The one sent to Bermuda was my back-up. We’re at 38 degrees N, 46 degrees W making 7 knots towards Horta, 12' to 15' following seas, 2nd reef in main, reefed jib, 15 to 20 kts of wind out of the SW, broad reaching. CPT has not slipped or groaned once, sure beats standing at the helm—Yes, this is a mid-Atlantic testimonial. PS—The Trans-At was too exhausting with a 65' and a wife and 2 kids for crew! Sirs:…I would appreciate your servicing this unit…I have had the unit for 12 years and have been very happy with it. I also recommend this unit to anyone interested in purchasing an autopilot. Mr. Pukit: I installed my Autopilot II aboard our 43' Perry designed cutter 3 years ago, and have since sailed through the Bahamas, 3 years in the Carribbean, up the Pacific side of Central America and then across the Pacific to Tahiti (current location) on our way to Tonga. The Autopilot II has performed flawlessly for over 8,000 miles through a 3 day, 45 knot gale with 15 foot breaking seas, as well as the prolonged calms of the doldrums. …I will highly recommend the Autopilot II for anyone considering serious off-shore cruising. Mr. Pukit: The CPT worked superbly in heavy seas and winds in all directions of sail, exceeding all expectations. Charlie: I want to report the results of your recent “heart and brain” surgery upgrade to my 1979 Autopilot. As you know, I was most reluctant to have anything done to something that has worked so well for so long…I’m from the “if it ain’t broke, don’t fix it” school. Shortly after getting our 1979/1990 Autopilot upgrade from you, Ann and I set off for six weeks in the Exumas in our Vagabond 47. Your autopilot never missed a beat and it did perform better than our old friend (which I didn’t think was possible). Of all the gear I have aboard, your Autopilot is the lowest maintenance—all I do is hose it down every now and then…Thanks Charlie, for talking me into upgrading my old pilot. As good as it worked, your new electronics are better! We hope to see you in a couple of months at the Miami Boat Show. Charlie: The good ship Alaskan Sea Cur was hardly ready for sea and it was three long weeks at Little Harbor Marine just to make ready for sea trials. On that momentous day, while the electronics tech was attempting to interface the $4,995 [other brand] Auto Pilot, we lost the steering. They spent another week replacing all the bearings, and that was fortunate for this is an interesting steering system. Shaft drive driven bevel gears from the wheel turning a short quadrant, with 1½ turns lock to lock. That’s right, just over ½ turn and you are HARD OVER! Needless to say, if you let go of the wheel, it’s too late to “close the barn door”. And of all the $90,000 worth of electronics, guess which one never did work. Right again, the [other brand] autopilot. Fortunately, I just happened to have brought along my own Autopilot II, so with a quick fabrication of a bracket, two holes drilled in the cockpit side, and presto the autopilot is installed. The question was could it steer this vessel. While doing a fine job of handling my 38' sloop, what would happen on this schooner? I imagine you know the rest. It works just fine and we have completed a 6,300 mile delivery, and “Charlie” has been a match for every test. With the heavy load, we managed to sheer one of the sheer pins, but then I guess that’s what they’re for. So anyone contemplating saving several thousand dollars on their autopilot installation, might consider the AUTOPILOT II and a spare set of pins. Much less than some of the fancy systems around, and one happy captain, here, for I have no taste for sitting at the wheel in 20 degree weather or in the cold snow or ice. Thanks for having such an exceptional pilot, for I don’t know of another wheel mounted pilot that would come close to handling the steering problems on this schooner. Mr. Pukit: I have enclosed several snaps of my installation of your product on my Westerly 39' Sealord . First, I would like to put into writing my unqualified endorsement of the CPT Autopilot. This rugged, dandy piece of equipment took us from New York to Bermuda and back this past season, including almost a whole day DOWNWIND WITH LARGE FOLLOWING SEAS. This was possible by setting the rudder control high and the deadband low. It was an uncanny performance…Thank you for giving the sailing public a reliable, no-nonsense autopilot. Sir: After 4 years of reliable performance of your AUTOPILOT II on several boats in the 35' range we operate, this letter of gratitude is long overdue! The pilot is one of the most reliable pieces of gear we have ever used. After several hundred hours of use on each of the units we have not had a single failure. The level of dependability and performance you provide in your product should be the standard the rest of the marine industry tries to meet. Thank you & keep up the excellent work! CPT, Inc: The enclosed Autopilot has been about 4,000 miles as my most faithful helmsman, and has done an excellent job of steering my 46' cutter Essa all over the Carribbean, from Florida to Antigua and home again, stopping everywhere in between. We have become so spoiled that when we have to stand our watch actually at the helm we feel put upon by fate. Thanks for an excellent product, and good service when we needed it. “Willie” has performed with perfection over 10 years now. I have been very satisfied. Looking forward to Willie II. Charles, The Autopilot II is performing very well on my Columbia 43. It is my 4th autopilot, and it is the first one that worked immediately after installation, without any problems. Dear Charlie,…I bought my autopilot in late 1979 when I was preparing for a year’s cruise aboard our 37' one tonner. My boat was squirrely off the wind, so I wanted a pilot which would really crank the wheel fast and be a miser on power. Your autopilot has been simply sensational. From 1980 to 1986, we’ve logged about 15,000 miles, virtually all of which was under autopilot—we hate to steer. Coming back from the Caribbean, we sailed from Conception Island (Bahamas) to Georgetown, Exumas in a 25 knot downwind romp. We averaged over 8 knots from anchor up to anchor down! Our only steering was through the reef outside of Georgetown. About a year ago, we sold our one-tonner and bought a small ship—a Vagabond 47. It’s a 40,000 lb. Garden full keel cruising boat with hydraulic steering. Well, we’ve kept our wonderful pilot after talking with you, and fitted it aboard. The steering is 6+ turns lock to lock, so when combined with the boat’s great weight, “responsive” wouldn’t be a word I’d use to describe the boat’s handling. You’ll be pleased to know that the pilot works just great. I crank the rudder up to a 6, set the deadband as low as possible and the course is perfection itself. Charlie, your autopilot has done more to enhance the experience of sailing (and to relieve the burden of steering under power) than any other single piece of gear on the boat. Our longest passage was 13 days during which we hand steered only about 4 hours. We motored up and down the Waterway and Erie Canal from North Carolina to Cleveland using the autopilot most of the time. I can’t imagine sailing without an autopilot; how else could you watch the dolphins under the bow, or land a nice fish, or daydream, or sail short-handed? …Your Autopilot II leaves the aforementioned pilots way behind. The best test for a pilot is to be on a reach or running in about 25 kts of wind. I ran for about 10 hours under these conditions and did not touch the pilot. I really believe you have a fine product. …Of the three different pilots that I have, this is still my favorite pilot, So Charlie, take good care of my old Faithful and send her back as soon as possible. Charlie, Let me congratulate you on the outstanding achievement your autopilots. This was the first year that I have used one of your units and it did an exceptional job of steering my 36' Hinckley Pilot, Indu. …Indu finished 1st in class crossing the finish line ahead of all the boats in its class. Most of this success was a result of your excellent unit. Your CPT unit was far superior to the [other brands], and the “waterproof” French unit that I have tried in other races over the past 8 years of single-handing. Your CPT is now a permanent member aboard Indu. Sirs,…the autopilot has proven a good friend. We’ve sailed for nearly 4 years now and have not experienced any of the difficulties associated with other autopilots, although the chain drive was the weak link. I believe the new drive will be superior. Except for the stretch of the chain, I couldn’t be happier with this unit. I’m a commodore in the SSCA and in the near future I hope to write a blurb in the bulletin about my experience with the autopilot. I have two babies aboard with a wife that regularly succumbs to seasickness, and a reliable autopilot is a virtual necessity. At first I was suspicious of the cost and effectiveness so I bought two, one would be a complete spare. For 4 years and 25,000 miles, I’ve never opened the other box. Thanks. We have just returned from a 4000 mile voyage in our 50' motorsailing vessel, “Bon Voyage”, using your Autopilot entirely throughout a circumnavigation of the Gulfs of Mexico, Belize and Honduras. During the time of the voyage, we encountered seas from flat calm to 18 foot with high winds, under both sail and power. Your Autopilot operated PERFECTLY throughout the voyage, with one exception during the last two days of the trip: when a Cuban Patrol Craft intercepted us off the golfo Guanacabibe, we forgot to disengage the Autopilot when we swung the wheel hard over, and broke the chain! We are VERY satisfied with your unit, and indeed my wife would refuse to sail on extended passages if we did not have it. We carry no crew besides ourselves and AUTOPILOT keeps it relaxed and restful aboard for us. Please feel free to refer any potential clients to us for a sincere and glowing recommendation of the dependability of AUTOPILOT. I am the owner of an AUTOPILOT steering device which I bought along with my Hunter 30 sailboat in 1979. The unit was installed by the delivering yacht yard and performed as advertised…which is to say, great. Dear Pierre, I don’t write many fan letters, but this is one. I’ve just returned from a 10 month cruise to the Carribbean aboard my 36' Pearson one tonner which saw 5,000 miles pass below the keel. During this cruise, your pilot steered absolutely flaultlessly in conditions ranging from dead calm to downwind tradewind runs of 25 knots. I can think of no other single item which I fitted aboard my boat which was so worthwhile and trouble free. It was simple to install, easy on the batteries, a cake to operate, and always attentive to its duty. On several occasions, I’ll swear it steered around ships at sea! If you ever need an enthusiastic testimonial, you’ve got mine. You have a dynamite autopilot and I’m proud to own one. We are bouncing over the very blue waters of the Pacific Ocean at approximately Latitude 20 degrees N, and Longitude 118 degrees W between Acapulco, Mexico and the Hawaiian Islands. We’ve had a perfectly beautiful 5 months of cruising the west coast of Mexico and are now reaching further out—3,100 miles out! Each day we have a conversation about how much we appreciate your autopilot. It has been a good, steady friend that has increased our enjoyment of the trip immeasurably. The chain got a little stretched out and tired so we slipped on a new one at our last anchorage and it’s running with renewed spirit now. We’ve sailed with your Orinda Controls Autopilot in choppy seas with 20 knot winds for hours on end and had no course deviation. What more could anyone ask? A word of thanks to you for your fine unit. We have a 31' O’Day and during the past year have traveled some 4,000 plus miles on her. Without the autopilot this would have been an awful lot of boring open ocean sailing. It has always operated perfectly—a real joy. This is a fan letter for the Orinda autopilot. Life aboard for the two of us is so much easier and pleasant: meals together, sail handling together, time to sit together and watch the sun set. Thanks to that reliable little box. Thanks for a good product and a real boon to shorthanded boats. …It was great all through an offshore trip from Fl to Mass—even through 3 days & nights of a tropical depression. It even steered with a following sea under bare poles in 40–50 knot winds. © 2019 CPT Autopilot Inc.